Super Saturday’s feature race at Belmont Park is the Jockey Club Gold Cup Invitational Stakes that takes place Saturday, September 28, 2013. The $1 million race for three-year-olds and up is part of the “Win and You’re In” Breeders’ Cup Challenge series and will be used as a final prep for a few of the top Jockey Club Gold Cup contenders. Post time for the headliner race is approximately 5:49 PM EDT and is the 10th race of the day. 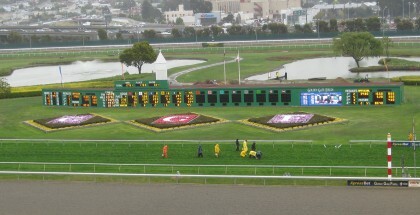 The 2013 Jockey Club Gold Cup Invitational hosts a field of eight to run on the 1 ¼ mile dirt track at Belmont Park including the 2013 Kentucky Derby winner Orb. Orb enters the Jockey Club Gold Cup with a new teammate, jockey Javier Castellano, after finishing third in the Travers Stakes with jockey Jose Lezcano. Orb’s regular rider, jockey Joel Rosario, is still recovering from a broken ankle but is expected to return to the track just in time for the Breeders’ Cup championship. The Shug McGaughey trained colt enters the Jockey Gold Cup with 9/2 odds. Palace Malice and jockey Mike Smith enter the Jockey Club Gold Cup with 4/1 odds. 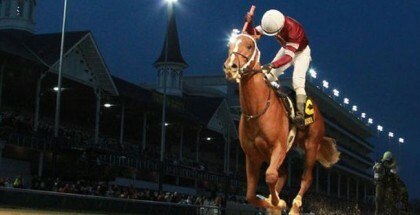 Seven-year-old Flat Out, with 3/1 odds, won the 2011 and 2012 Jockey Club Gold Cup Invitational Stakes and is seeking another victorious win. The only other horse to win the Jockey Club Gold Cup Invitational for three consecutive years was Kelso in 1962. The William Mott trained horse relishes in the Belmont Park track and is said to be most comfortable there. Flat Out has crossed the finish line first in five out of six races at Belmont Park, most recently in the Suburban Handicap on July 6th. 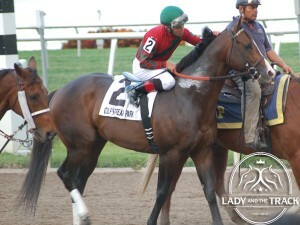 Last out on August 31st, Flat Out finished 2nd to Alpha in the Woodward Stakes at Saratoga Race Course. Cross Traffic, with 5/2 odds, is a true force to be reckoned with. 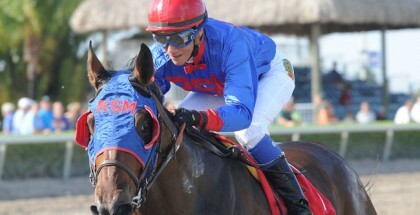 The four-year-old colt is the favorite amongst the experts and has superstar jockey John Velazquez on the mount. Cross Traffic has never gone the 1 ¼ mile distance but I think he’ll finish it easily and effortlessly. The Todd Pletcher trained colt has finished first in three of his five career starts, most recently in the Whitney Invitational on August 3rd. Todd Pletcher also enters Belmont Stakes winner Palace Malice with 4/1 odds and Vitoria Olimpica with 20/1 odds into the Jockey Club Gold Cup. 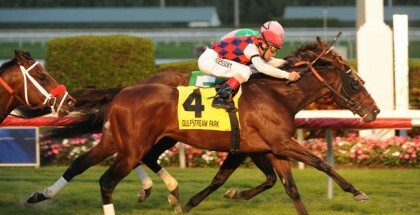 Flat Out will attempt his third Jockey Club Gold Cup win on Saturday, September 28, 2013 at Belmont Park.